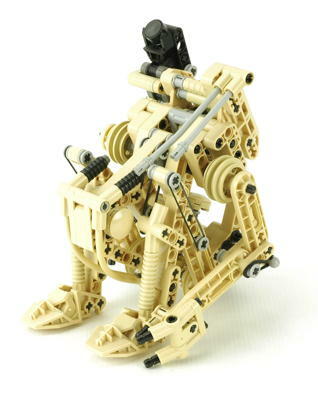 The Battle Droid was among the very first line of Star Wars Technic models. The battle droid appears extensively in Episode 1, the only prequel released at the time, and then later in Episodes 2 and 3. Just like the droid in the movie, this model can be collapsed for storage and then pops open when needed. In this case the mechanism is initiated by a button on the back. The mechanism is driven by a series of rubber bands (knees, legs, button, elbow, and neck). The stability of the model when standing depends entirely on the rubber bands which degrade over time and eventually result in the model falling over. Fortunately, extra rubber bands were supplied with the model. The model construction relies heavily on parts from the recent Slizer and Roborider themes. The feet are made from Slizer heads, and the arms and backpack from Slizer and Roborider parts. 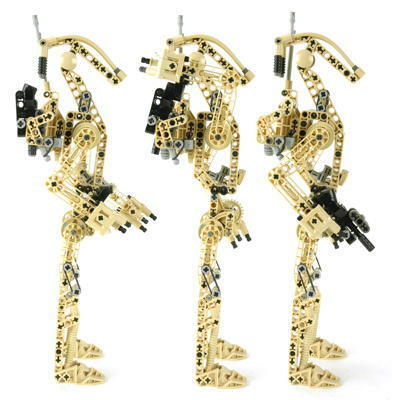 The remainder of the parts are studless Technic parts but in tan. 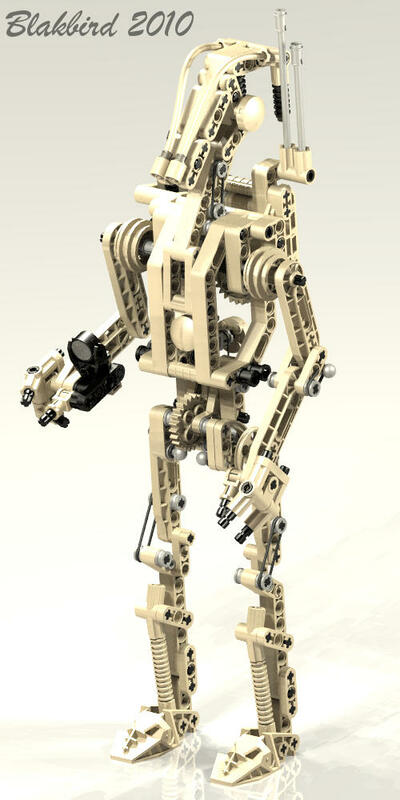 Tan had never appeared before; LEGO® Star Wars was its first appearance. There are also magnets as featured in the old M-Tron sets here. The default model has black "ears", but these and other parts can be changed for yellow or red to signify different ranks. The model includes instructions for an alternate model of an AT-ST.
Just like the battle droid in the movie, the model collapses into a small size for storage. The knees fold back and the legs fold forward. The hip joint is connected to a ratchet that locks the legs in the folded position. The head and neck pivot down on a 4-bar linkage between the legs. The arms do not fold. When .032a button on the back is pushed, the ratchet is released and the model pops open using rubber bands. The model is designed such that the rubber bands are all shortest when the model is standing, therefore this is the stable configuration towards which the rubber bands drive the model when unlocked. This model has a nifty feature which allows the droid to draw his weapon from his backpack. When a gear on the back is turned, the right arm rotates back and a magnet on the wrist engages a magnet on the weapon. Turning the gear the other direction causes the arm to pull the weapon from the backback. It then flips down into the droid's hand. The whole motion works very well and appears quite realistic when compared with the motion in the movie. The right arm's elbow is locked at 90°. This is required to force the magnets to line up.